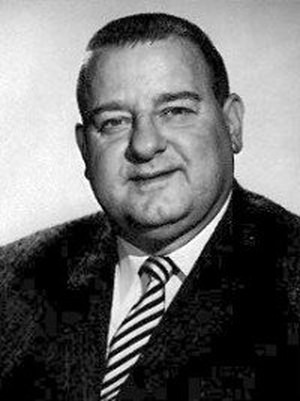 Best known for his portrayal of Curly in the Three Stooges, Joe DeRita brought big belly laughs to old time radio. "Joe DeRita in Command Performance"
DeRita was a reluctant third Stooge, not one to do another man's routine. His Curly-Joe was a bit more nuanced than the original Curly. And his shuffle was just as graceful . Glasses clink throughout the small, smoky room; a waitress in black stockings and a bustier hustles to crowded tables; narrow-faced men in derbies and fedoras hunker over secretive business in the back corner. And on stage prowls a barrel-chested man with a red beak for a nose and a world-weary smirk that says, "don't mess with me": Joe DeRita. This could be a Los Angeles nightclub or a seedy burlesque joint anywhere in the United States. The year is 1942, and this is grueling work. This isn't the USO, and Joe DeRita doesn't have Randolph Scott as his straight man. Not tonight, in this gin-soaked, red-carpeted room. And he doesn't have Bing Crosby either. He's not entertaining fresh-faced troops tonight. That life is over. But there's always another club, another stage, particularly to one born in this business. DeRita was born in Philly, the child of a stage technician and a dancer. He'd been performing since the age of seven and was now no stranger to the burlesque circuit. And it was there where DeRita was spotted by scouts for Columbia Pictures. Soon, he became an actor of the screen, a comic in short films. 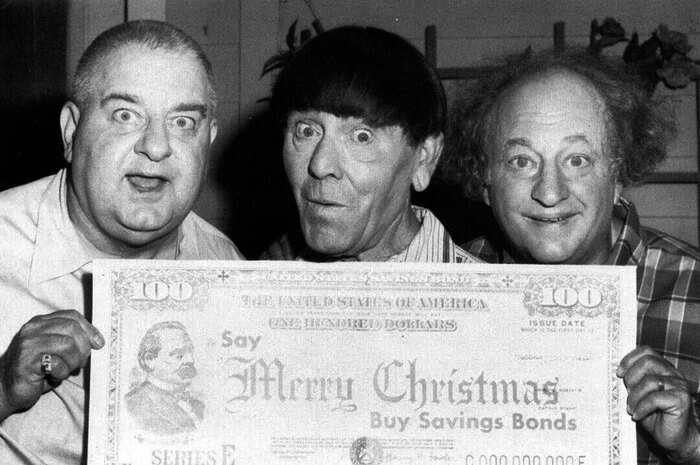 In that life, he'd cross paths with another Columbia troupe, the Three Stooges. With Jerome "Curly" Howard retired due to a stroke, the Stooges' lineup was in disarray, and they courted the imposing DeRita as a temporary replacement. But DeRita didn't want to be a rent-a-Curly. He didn't want to do someone else's schtick. Later in life, Joe would tell an interviewer that he didn't think the Stooges were funny. For him, it would be more dim lounges, telling jokes between strip teases. But in 1955, Shemp Howard died. 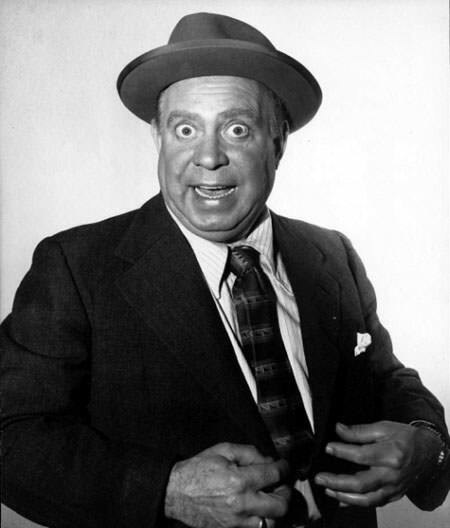 His replacement, Joe Besser, took off in 1957. One of the remaining Stooges, Larry, saw DeRita onstage in Las Vegas, and raved about the man's talents to Moe. The Stooges were, at that point, bigger than ever: their television show was now syndicated on Screen Gems, which meant their live show and short films and other projects had to go on. This time DeRita agreed and became the third Stooge. He was eventually convinced to shave his head and take on the moniker Curly-Joe. He toured with the famous act and shot a couple of movies with them: 1959's Have Rocket, Will Travel, and--get this--Snow White and The Three Stooges. So history knows the hard-charging wit not just as a nightclub performer and short film star, but as the youngest of the Three Stooges. But he also made his mark on the world of old-time radio. Tapped for his prowess as a teller of jokes and as an actor, long before his work with the Stooges, DeRita booked appearances on The Bob Burns Show (July 1, 1943), Cavalcade of America (Feb. 5, 1945), Command Performance (Mar. 4, 1944), and Radio Hall of Fame (Dec. 24, 1944). To these shows, DeRita brought his gift for cracking wise and immersing himself in the role of tormentor of the straight man. When you hear his comic stylings, you will know you're listening to a road-sharpened veteran. Be the first to comment on "Joe DeRita"